"Two days before the battle of Fredericksburg, [Union] General Foster left New Bern, N.C., with a force of 10,000 infantry, 6 batteries, having all 40 pieces of artillery, and 640 cavalry...After the engagement, General Foster withdrew his troops and returned to New Berne (present-day New Bern). 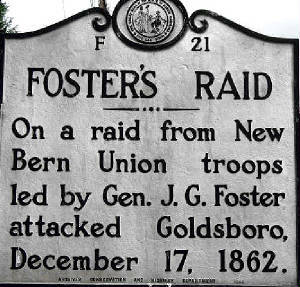 The total Federal losses during the "Goldsboro Expedition," aka Foster's Raid, were 592 killed and wounded. The total Confederate loss, as reported by General Smith, was 339." 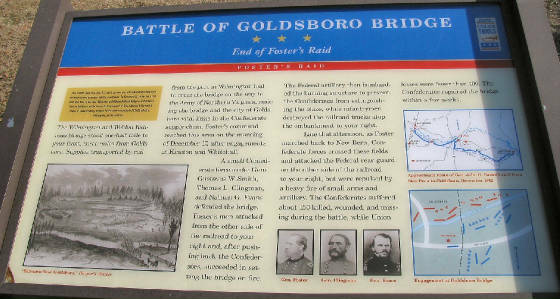 The Goldsboro Expedition (aka Foster's Raid), December 1862, consisted of the following North Carolina battles: Battle of Kinston (aka First Kinston); Battle of White Hall Ferry (aka White Hall and Whitehall); and Battle of Goldsboro Bridge (aka Goldsborough Bridge, Goldsboro, and Goldsborough). General Foster with 5,000 men left Washington, N.C., for Williamston, on the 2nd of November 1862. At Little Creek and at Rawls' Mill, spirited resistance to his advance was offered by the Confederates, and Foster lost 6 killed and 8 wounded. The Confederates, however, were not in force enough to do more than retard Foster's movements. Captain Newkirk, of the cavalry, and Captain Adams, commanding a section of artillery, attacked and destroyed the Union gunboat Ellis on the New River. According to General Whiting's report, this affair was very creditable to the officers and men engaged. Two days before the battle of Fredericksburg, General Foster left New Bern, N.C., with a force of 10,000 infantry, 6 batteries, having all 40 pieces of artillery, and 640 cavalry. 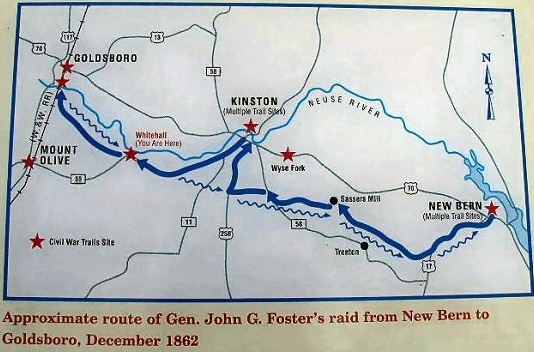 On the 13th, Foster had reached Southwest Creek, not far from Kinston. 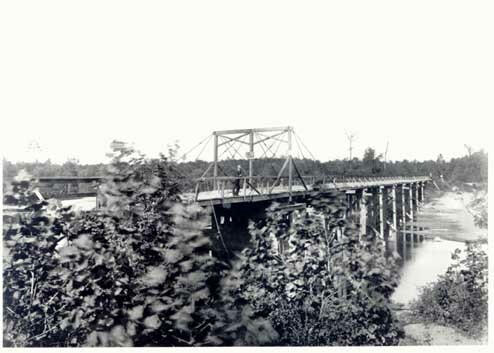 The Confederates had destroyed the bridge, and Colonel Radcliffe's Sixty-first North Carolina Regiment was posted on the west side to delay Foster's advance. The Ninth New Jersey and Wessell's Brigade crossed over the creek, and after an engagement of about an hour, General N. G. Evans, commanding the Confederates, was obliged to withdraw. He took position on the Neuse River, about two miles from Kinston bridge. General Evans had, to oppose Foster's 10,000 men, the Seventh, Twenty-second, and Holcombe's Legion, all South Carolina volunteers; in addition, he had the Sixty-first North Carolina Regiment, Mallett's North Carolina Battalion, and Boyce's South Carolina Regiment, and Starr's and Bunting's North Carolina batteries--in all 2014 men. While Evans was moving from the creek to the river, a fleet of small gunboats that had come up from New Bern to attack the works at Kinston, under Commander Murray, endeavored to get in reach of the works. Owing to low water, only one of the boats, the Allison, came into action, and Colonel S. D. Pool's battalion of heavy artillery soon drove it back. On the 14th, General Evans, with his South Carolina on the left and the North Carolinians under Radcliffe on the right, awaited Foster's attack. Foster sent in Wessell's brigade and batteries, supporting Wessell's by Armory's brigade and then by Stevenson's brigade. The odds were, of course, too great for Evans, and after two and a half hours of stubborn contention he was forced back across the bridge, and followed so closely that at the crossing 400 of his men were captured. Evans reformed his broken lines, and was joined by the Forty-seventh North Carolina, which had just arrived, under Colonel S. H. Rogers. "Owing to a range of hills on the White Hall side, the enemy had the advantage of position. The point occupied by his troops being narrow; not more than one regiment at a time could engage him. I therefore held Leventhorpe, Ferrebee and Evans in reserve, leaving the artillery [two pieces], Thirty-first regiment, and two picked companies in front. The cannonading from the enemy's batteries became so terrific that the Thirty-first regiment withdrew from their position without instruction, but in good order. I immediately ordered Colonel Leventhorpe forward. The alacrity of with which the order was obeyed by his men gave ample proof their gallant bearing, which they so nobly sustained during the entire fight....The conduct of his regiment reflects the greatest credit upon its accomplished and dauntless commander." "Posted along the river bank, from which another regiment had just been driven back, it was pounded for several hours at short range by a terrific storm of grape and canister, as well as musketry; but it never flinched, and gained a reputation for endurance and courage which it proudly maintained to the fateful end." The Eleventh regiment that thus distinguished itself was the first regiment organized in North Carolina, and it was well known as the "First North Carolina." It was also known as the "Bethel Regiment," because it had fought at the first land battle of the Civil War. (The first engagement was known as the Battle of Big Bethel and also the Battle of Bethel Church, and it witnessed the first Confederate soldier killed.) General Robertson reported his loss at 10 killed, 42 wounded. The Federal loss was 8 killed and 73 wounded. 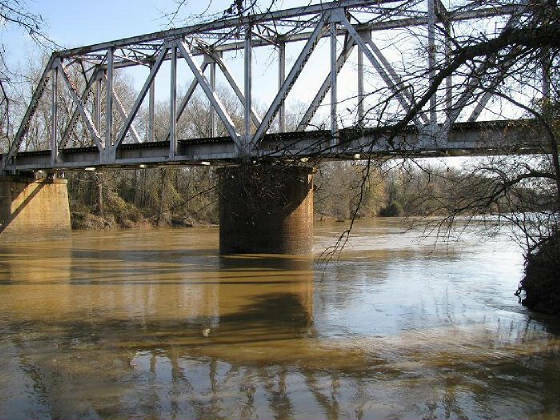 After his brush with Robertson, Foster moved on toward Goldsboro, his main objective being to burn the railroad bridge there. At and near the bridge were stationed General Clingman, with the Eighth, Fifty-first and Fifty-second North Carolina Regiments, under Colonels H. M. Shaw, W. A. Allen and J. K. Marshall; Companies B, G, and H, Tenth artillery, acting as infantry, and Company P, Fortieth artillery, acting as infantry, under Lieut. Col. S. D. Pool; and Starr's Battery. Other troops were in the vicinity, but for reasons not now apparent, were not moved to the bridge in time to assist the men engaged. The Sixty-first regiment, Lieutenant Colonel Devane, arrived on the field during the engagement and reported to its brigadier, General Clingman, in time to take part in the afternoon action. 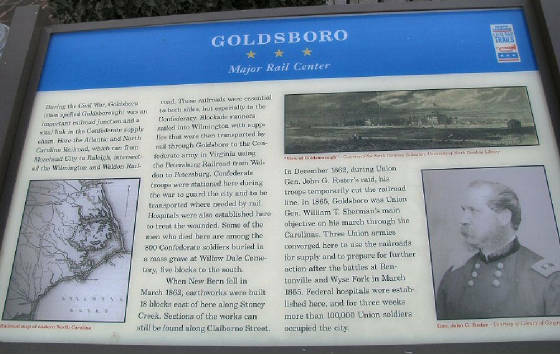 When General Foster reached a point near Goldsboro, he ordered five regiments to move down the railroad track and burn the bridge. A regiment was sent with them to protect the flank. 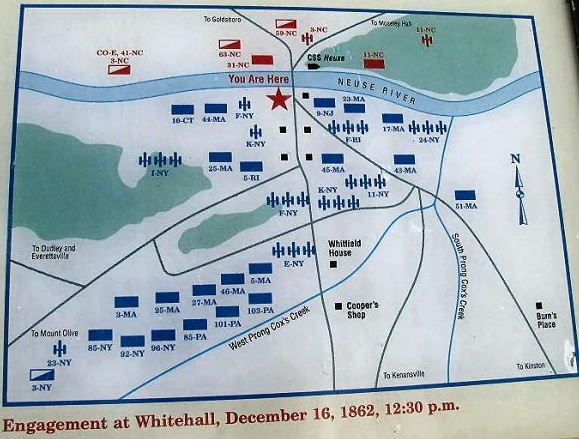 General Wessell's brigade was advanced, to be in supporting distance of the advance. The Federal regiments and artillery attacked promptly. All the Federal artillery seems, according to Foster's report, to have engaged at the bridge. The attack fell principally on the Fifty-first and Fifty-four regiments on the south side of the bridge. Starr's two pieces opened. 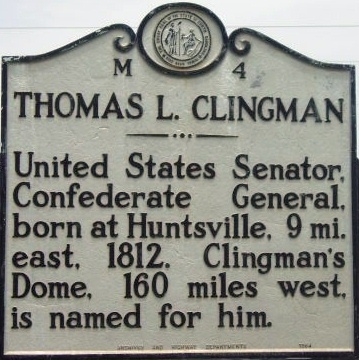 The two regiments were unable to hold their own, broke, were reformed by General Clingman, and ten driven back to the county bridge. As these regiments were in retreat, Lieut. George A. Graham, of the Twenty-third New York Battery, dashed gallantly forward, and in spite of the efforts of Pool's men to reach him with their rifles, set fire to the bridge. "A portion of the enemy instantly with loud cheers, charged up the hill toward the battery, and bore up steadily in the face of a well-directed and most destructive fire... The enemy, meanwhile, had been staggered by the crushing fire of the batteries, and at sight of my supporting regiments, broke and fled in disorder to the woods. His retreat was covered by a heavy fire from the battery on his right, which inflicted on my command a loss of 3 killed and 19 wounded." This "battery" as Colonel Lee calls it, was one gun of Lieut. T. C. Fuller's section of Starr's; the other gun was overturned. Lieutenant Fuller acted with great coolness, and showed a soldier's aptitude for finding and striking his enemy. 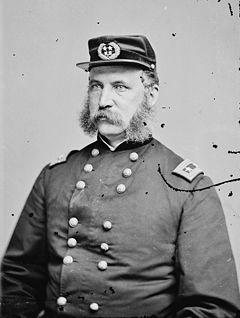 General Clingman said of the determined manner in which Fuller fought his solitary gun: "Lieutenant Fuller with the greatest gallantry continued to reply until darkness put an end to the contest." Captain Reinhardt's company of the Third regiment of cavalry is warmly commended in the report of Colonel Stevens.